St Paul's was built in the 1970's as an Open Plan School. The physical structure of the school, is still true to this design and hence invites a wonderful social atmosphere where all who enter the school, are visually able to see class groupings at work and play. Each of the 15 classes have a ‘Homeroom teacher' who would engage the students for most of the day. The students also work with a number of other teachers and LSO's (Learning Support Officers) throughout the week who deliver different aspects of the curriculum eg. Health & Physical Education, Library , Languages (Italian), Digital Technology, DrumBeat, Multi-Lit, Reading Recovery , Synthetic Phonics ( Get Reading Right) and Spelling Mastery etc. Pastoral Care is very much part of the St Paul's ethos and is strongly evidenced in the welcoming and caring atmosphere of the school. It permeates all aspects of school life. It aims to support the students in their growth (spiritual, emotional, intellectual and physical) and build upon the foundations provided by their parents. We aid each individual student to develop a sense of self-worth and an understanding of their role and responsibility within the local community, to the environment and the world at large. St Paul's is engaged in Whole School Positive Behaviour Supports. Staff are inserviced on an annual basis to ensure the acceptance and effectiveness for our entire school community. Each member of staff is responsible for the Pastoral Care of students, their families and our staff. They are further supported by staff with specific roles such as Wellbeing Leader, Religious Education Leader, and Pastoral Care Worker. 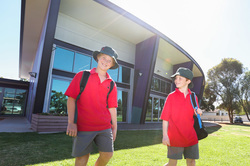 This is enhanced by (but not limited to) fortnightly assemblies led by the School Student Leaders, Class Masses held in the Chapel, House structure (Chaffey, Hill, McKenzie & Mercy), House captains, "Buddy" system for Foundation students, Family Support Groups, Food Bank, Hands Up Mallee Healthy Program, Cultural events and social gatherings/fundraising. St Paul's School recognises that parents are the prime educators of their children and seeks to support them in their children's education and faith formation. Success is most likely where the school and parents share a common vision of Catholic education. As pastoral and liturgical leaders, the Parish Team (Fr Michael McKinnon & Fr James Kerr) make a significant contribution to the life of St Paul's. Although St Paul's is physically remote from the Sacred Heart Church we acknowledge & celebrate our link to the Parish in many aspects of our school community. These include wider parish community joining us to celebrate whole school Masses, Staff Commissioning Mass at the beginning of each year at the Sacred Heart Church, Ash Wednesday Mass and Catholic Education Week mass, representation on the Parish Council, and involvement in the Sacramental Program. Click on the button below to learn more about the Parish Sacramental Program and who to contact. PLEASE NOTE: To ensure the safety of all children, please do not send nuts or foods containing nuts to school with your child, as nut allergies are quite prevalent. School canteen operates on Monday, Wednesday & Friday to provide nutritious lunches for students. A price list is available from the foyer noticeboard or can be downloaded below. To order please write the child's name, class, order on a paper bag and enclose, if possible, the correct money. The child places this in the class lunch order box prior to 9am. The canteen is staffed on a voluntary basis by parents. A co-ordinator is paid to order and prepare for the volunteers. Please let us know if you can help - weekly, fortnightly, monthly, once per term, emergency etc. Brain Food - It is an expectation that every student has a water bottle (filled only with water) and that it be available on their desk during the school day. Students have a "Brain Food" snack during class each day. It must be something that is healthy and able to be eaten at their desk with minimal mess eg piece of fruit, popcorn, dried fruit etc. Snacks can be purchased from front reception each morning before school. St Paul's was built in 1974 by the Mildura Catholic Community with the help of a substantial Government Grant. Extensions were completed in 1983. Our aim is for an educational community directed toward the full development of all concerned, especially the students. 1997 saw the completion of further extensions and refurbishment. During 2002 two new classrooms were built and two existing classrooms were refurbished. In 2005 extensions to the Josie King Library were completed. Late in 2005 the Chapel was relocated to our grounds and refurbishment completed in 2006. In 2010 the 2 basketball courts were resurfaced - one with artificial turf and the other with rebound surface as well as a solid roof over one of the courts. In 2011 the "Building Education Revolution (BER)" project was completed which encompassed the construction of a multi-purpose hall/canteen/toilet complex in addition to refurbishment of the original school building and a large outdoor learning area at the front of the school. In 2016, The school completed the refurbishment of the Pick Up and Drop Off area, a new undercover car park as well as internal refurbishments. These internal refurbishments included: Middle Unit classrooms, withdrawal rooms, relocation of the school library and foundation classes, new sports storage/offices and archive area. In 2017 the school has undergone redevelopment of the ovals with upgraded sprinkler systems and will commence a Catholic Capital Grants roof refurbishment project mid year. The school has secured a$2 million dollars in funding to oversee this project. The school is built as an open-space school and aims to promote an open approach to the education of the students. For this to be achieved there is continual evaluation of methods both old and new. We see the School not as an institution divorced from family life and experience but rather as an extension of these. Parents are the prime and most important educators of their children; the school aims to accept this principle in practice as well as in theory, by seeking parent involvement at all levels of school life. The Chapel is an important focal point in the spiritual life at St Paul's. It is a place for the regular celebration of class Masses; weekly gathering of staff for prayer and a place of quiet reflection. There is also a contemplation area in the garden surrounding the Chapel. The Chapel building itself is very significant in the history of the Catholic Church and Education in Mildura. In response to a search by St Paul's for a building, St Joseph's College offered the building known as their Religious Education Centre which in fact was the original Catholic Church here in Mildura. The Church was first located in Pine Avenue and was formerly opened 7th June 1896, by Rev. Father Barry of Ballarat with the original cost being Three Hundred Pounds. In January 1906 the Sisters of Mercy opened a primary school conducted daily in this building until 1914 when a school building was then erected in Walnut Avenue. In 1920 a new brick church was built, and the old church was given to the Sisters by Bishop Foley of Ballarat. In 1922 it was re-sited on the block facing Twelfth Street and was used for a variety of purposes including art, typing and woodwork. In 1979, it was again relocated in St Joseph's College grounds and reconditioned for use as an art/craft centre. This weather-board building has been moved many times and we are extremely pleased to be now entrusted with this historic building that takes pride of place as St Paul's Chapel in our garden area known as "Mac's Patch" (so named after Monsignor MacKenzie). 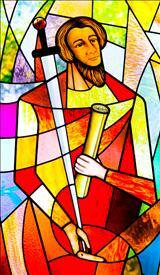 The "Mimovich" stained glass windows of St Paul and Our Lady were completed in 2008 thanks to the generosity of the school community. Alternatively, Order forms are available from the Front Foyer or can be downloaded below. Completed forms may be left at the office and will be filled on the next uniform shop day. There are additional Opening Hours during Orientation and prior to the beginning of School Year. These are advertised in the school newsletter.